24 EU-based scholars from 7 universities will meet with 23 Japanese colleagues from 6 universities to discuss EU-Japan in a Fluid Global Liberal Order. 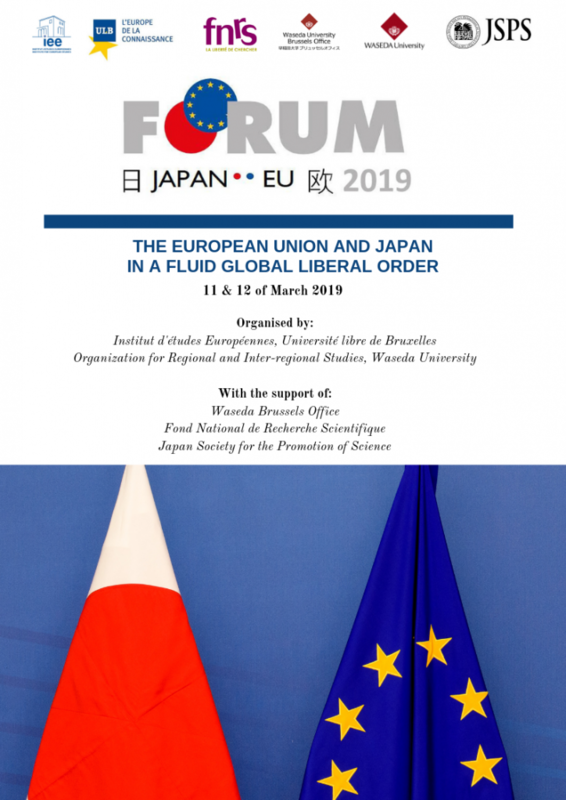 The Institut d’études européennes of the Université libre de Bruxelles (IEE-ULB) and the Organization for Regional and Inter-regional Studies (ORIS) at Waseda University are jointly organizing the 19th annual EU-Japan Forum on March the 11th and 12th 2019. Hosted at the IEE-ULB, this year’s iteration will also enjoy the further support of both the Belgian Fond National de la Recherche Scientifique (F.R.S-Fnrs) and a Core-to-Core project funded by the Japanese Society for the Promotion of Sciences (JSPS). The forum is set to bring together: 24 EU-based scholars from 7 European universities, on the one hand; and 23 Japanese scholars from 6 Japanese ones, on the other. Besides building on more than a decade-and-a-half of cooperation, this year’s forum’s timeliness is further enhanced considering the recently launched EU-Japan Economic Partnership and Strategic Partnership Agreements (EPA/SPA). Discussions are expected to lead to a series of joint publications over the course of the coming years.